Lightning Arrester or surge suppressor is the protective device used in every electric substation (small or large) which protects the substation from lightning and other electrical transients. In the next article we will discuss about lightning arrester. 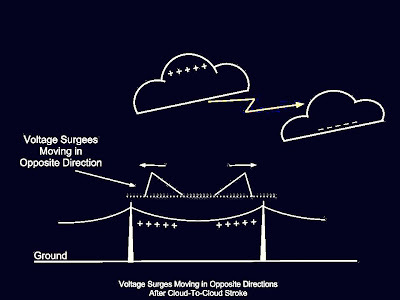 Before we discuss about lightning arrester it is important to learn some basics about the lightning phenomena. After all it is a very interesting subject. In last few centuries many scientists, engineers, philosophers and others have shown considerable interest in studying the lightning phenomena (perhaps due to the curiosity gathered from the childhood). The scientific theories formulated by them differ in some some aspects. However still there is much agreements between the studies carried out. For example in almost all the studies it is mentioned that in most cases the upper part of the cloud is positively charged and the lower part is negatively charged. (The way it is charged or the rise in charge quantity is explained differently by different researchers). We will discuss this in a manner which is well accepted and simple to understand. See the figure below. 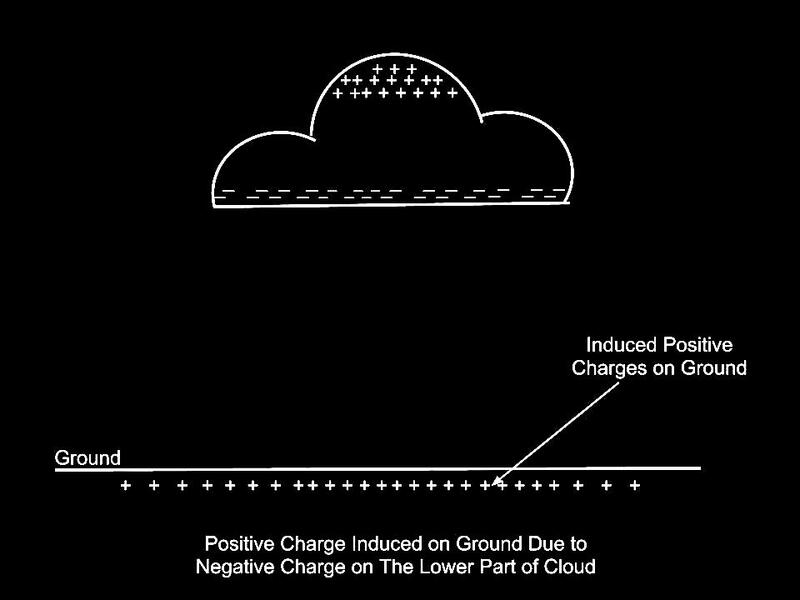 Consider the cloud whose upper part is positively charged and lower part is negatively charged. Due to this the portion of earth below the cloud becomes positively charged. 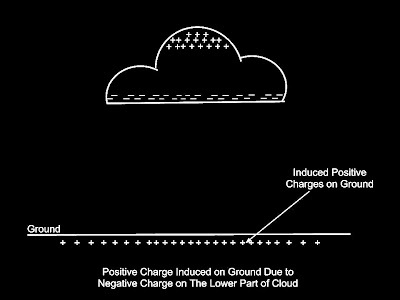 As the charge on the cloud increases, so also the charge induced on the ground below the cloud increases. This situation results in rise in the electric field intensity in the space between the cloud and the ground. Finally electric breakdown of the space between the cloud and ground takes place which is seen in the form of an electric discharge. The sequence of lightning stroke is as follows. As the charge on the lower portion of the cloud increases the electric field increases. This results in ionization of air in the vicinity of area with more charge concentration. Then an ionized path or streamer (stream of charges) develops. This is called as stepped leader(see below). The leader proceeds downward in steps of tens of meters with a speed of about one tenth the speed of light. 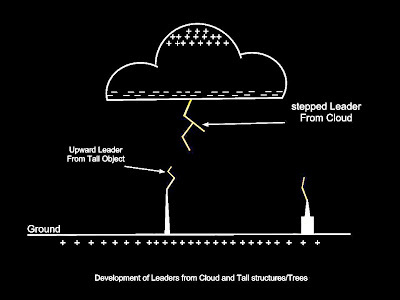 Several leaders may originate from the cloud at different parts of the clouds. The ground objects mainly the taller structures also ionize the air in the vicinity of its top and releases a stream of positive charge. That is to say the upward moving leaders usually originates from taller structures (see above). 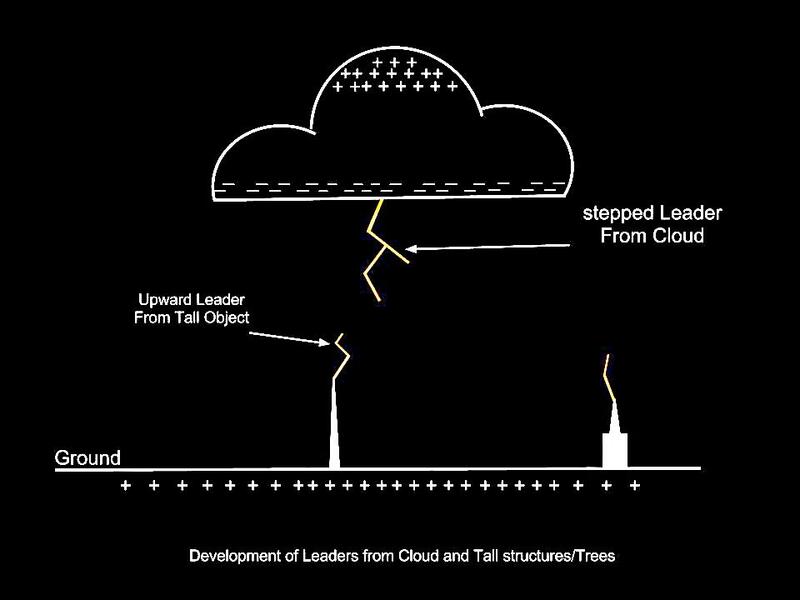 Finally the downward leader from the cloud may connect the upward moving leader. It results in a ionised conducting path giving rise to heavy current flow through this ionized path. This is called the return stroke. This lightning stroke may carry hundreds of kilo-ampere of current and extremely bright. This is known as direct lightning stroke. It may hit transmission lines and other electrical equipment developing voltage surge of very high peak value and causing extensive damage to the equipment or catches fire. Sometimes another form of surge develops in the overhead line. See the figure below in which there are two charged clouds. The portion of the transmission line below the cloud develops positive charge by electrostatic induction. 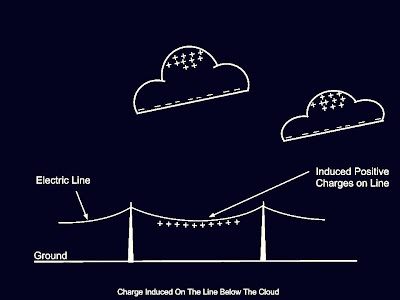 If the lightning discharge takes place between the clouds then sudden disappearance or rearrangement of charge on the clouds results in instant release of induced charge from the line portion (see figure below). This phenomenon gives rise to travelling voltage waves (due to moving charges) to both directions of the line (surges are shown side by). This voltage surges hit the electric equipment at line terminating points which may be a substation or generating station. The surges are equally harmful to line insulators. This is the induced voltage surge due to electrostatic induction. Voltage surges may also develop due to magnetic induction. 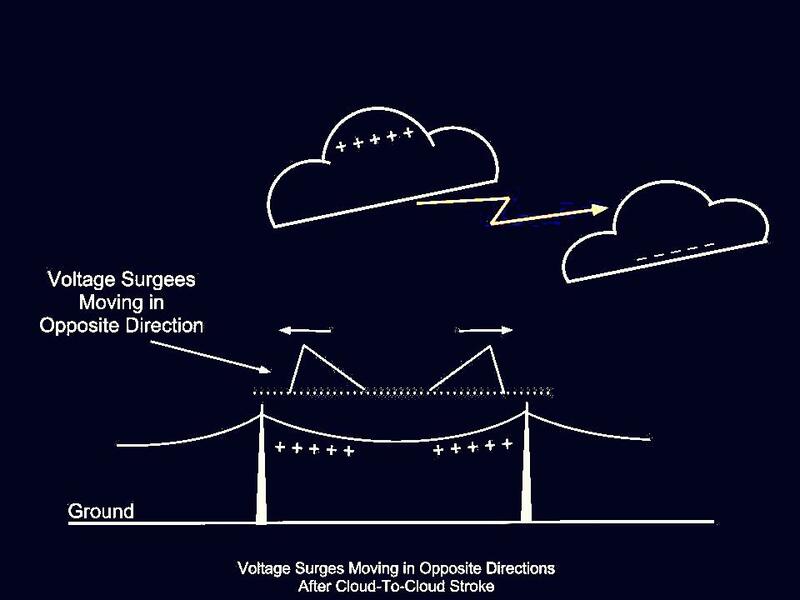 Due to the high current in the lightning stroke and/or lines due to surge current, strong magnetic field is created around it. Any conductor experiencing this magnetic field variation will develop voltage surge.